The admission to the park is free. Several archeological studies have testified a continuity in using and in attending the area from Prehistory to the present day, providing a large number of finds: tombs and grave goods, wall paintings, literature and popular anecdotes. Clandestine excavations, costruction works and hasty surveys, however, have caused a loss of some essential data and informations that makes quite difficult to reconstruct the complete history of the site. The discovery of flint and obsidian artifacts, dating back to the 6th and 5th millenium BC and found in the area between the lagoon of Santa Gilla and the hill of Tuvixeddu, proves the human presence since the Neolithic Age. 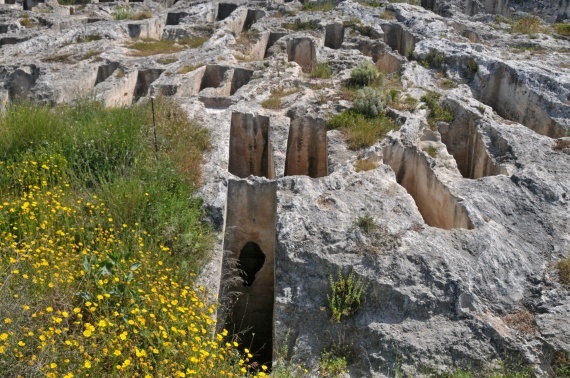 The Phoenician-Punic necropolis, the largest in the Mediterranean basin, developed between the 6th and 3rd century BC, through the excavation of the limestone rock to create burials, mainly well tombs, where the inhumated corpses where buried at a depth varying between 8 and 3 metres. The great archaeological relevance of the necropolis of Tuvixeddu is given also by the presence of wall paintings of an Northern African matrix, quite rare throughout the Punic world. The paintings, dating back to the 4th - 3rd century BC, show decorative floral patterns such as friezes of lotus flowers and palms, but also snakes, gorgons and geometric symbols. Particularly noteworthy are the Tomb of Sid, where the pictorial representation shows a significant similarity to the Sardinian- Punic deity of the same name, worshipped in the Temple of Antas, and the Tomb of the Uraeus, embellished by a refined pictorial frieze in which stands out the figure of the winged cobra snake. In the following centuries, the necropolis was further expanded at the foot of the hill, where the Romans dug burial chambers and pits. There are also monumental tombs belonging to famous people . In modern times, particularly during the 19th century, the area was used for industrial and residential purposes, as it is testified by the system of bourgeois villas surrounding the hill Tuvixeddu and the necropolis, like the beautiful Art Nouveau residence Villa Mulas (formerly Villa Massa), dating back to the early 20th century.